Want a filling and nutritious dinner on the table in under an hour? 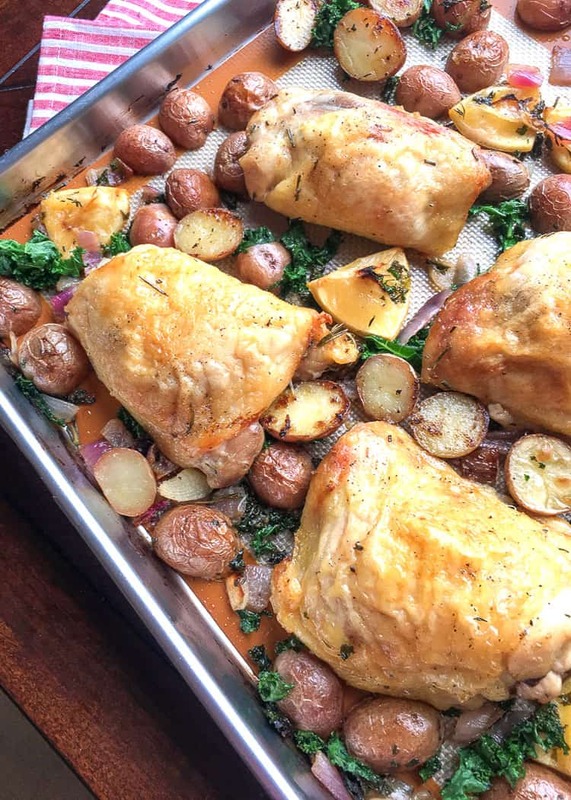 Grab a sheet pan and make this incredible Sheet Pan Herb-Roasted Chicken with Red Potatoes and Kale recipe! This hearty sheet pan recipe has it all. It’s ready in under an hour, it’s packed with nutrition (a healthy balance of carbs, protein, and fat), it’s a one-pan meal (clean-up is so easy), and the flavors are off-the-charts good. How can you argue with ingredients like this? Not only will this recipe help you get dinner on the table in a flash, your home will smell amazing from the aromatic ingredients baking away in your oven. A win-win! For best results, use a three-quarter size sheet pan. By using this size instead of a standard 13″ x 18″, you’ll be able to spread all the veggies in a single layer on the pan. 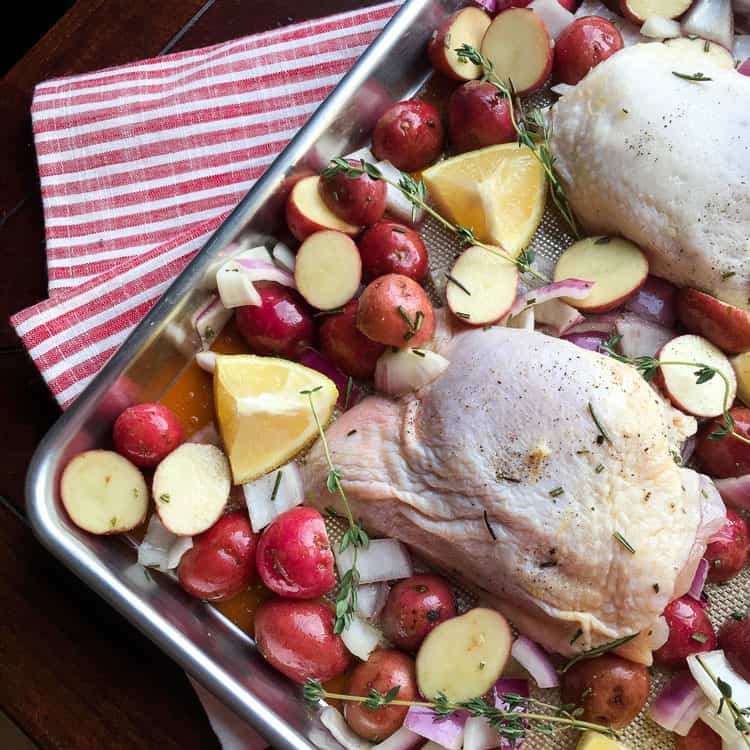 Everything will be roasted to perfection if the sheet pan isn’t overcrowded. Don’t split the ingredients across sheet pans. 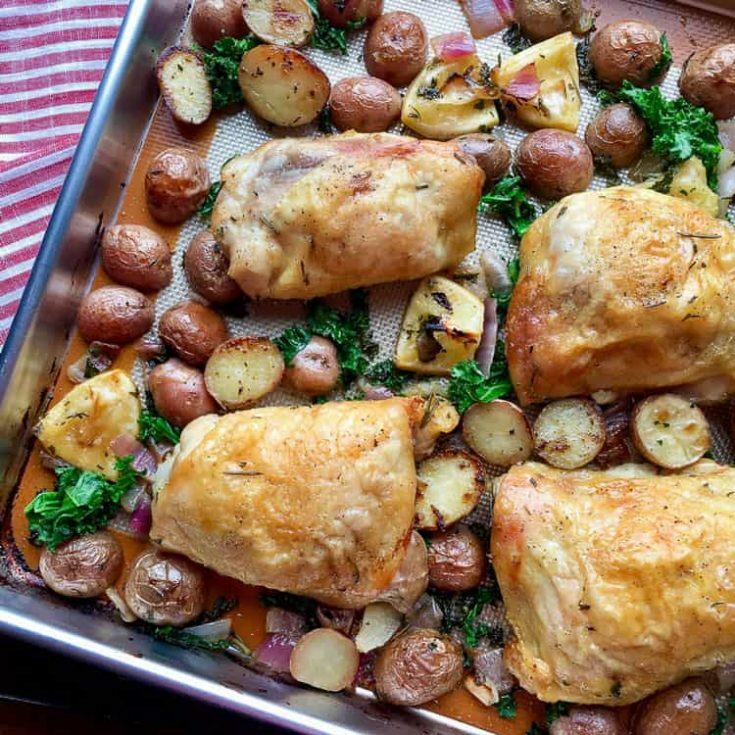 If you have smaller sheet pans, you might be tempted to bake the chicken thighs on one and the veggies on another. Don’t do this! By keeping everything on one pan, the juice from the chicken thighs and lemon will mix with the herbs and infuse the veggies with amazing flavor. Do NOT skip the meat thermometer step. It only takes a few seconds, and doing so ensures that you’ve safely cooked the chicken thighs to the right temperature. See the kitchen tools section below for my favorite brand. Use a silicone baking mat for easy clean-up. You can also make this recipe on parchment paper, but a silicone baking mat cleans up easy, plus it’s reusable. (No more going through roll after roll of parchment paper!) See the kitchen tools section below for my favorite brand. Meat thermometer: You’ll need to check the internal temperature of the chicken thighs to make sure they’ve reached a safe temperature (at least 165°F (74°C)). This convenient thermometer will give you an accurate reading in just 4 to 7 seconds! Silpat® baking mat: A silicone baking mat is a must-have for any kitchen because it makes clean-up so easy. They’re perfect for one-pan meals like this herb-roasted chicken recipe. Ready for another easy sheet pan dinner recipe? Try Baked Pork Chops with with Garlic and Broccoli. Enjoy! This Herb-Roasted Chicken with Red Potatoes and Kale is a hearty and flavorful sheet pan dinner option! Line a large, rimmed baking sheet with a silicone baking mat or parchment paper and then set aside. Preheat oven to 400°F. Combine red potatoes, garlic, red onions, olive oil, and fresh rosemary in a large mixing bowl. Season generously with salt and pepper to taste. Arrange vegetables on the baking sheet in a single layer. To the large mixing bowl, add chicken thighs. Coat with the remaining olive oil mixture. If desired, season chicken thighs with additional salt and pepper to taste. Place the chicken thighs between the vegetables along with lemon wedges and sprigs of thyme. Roast in oven for 30-35 minutes, or until the chicken is almost done and the vegetables develop a good color. Remove sheet pan from oven and stir in kale. Remove pan from oven. Transfer to a serving platter and loosely cover with a piece of foil. Let chicken rest for 5 minutes before serving. *Note: Always cook meat to temperature, not by time. The minimum safe recommended cooking temp for chicken thighs is 165°F (74°C). That looks delicious! I’m sure everyone in the family would be happy with this recipe!